The short, cold days of winter can leave adults and kids feeling a bit lethargic. After all, it’s hard to get your blood pumping when you’re cooped up indoors all day. Want to get moving? Check out these interactive museums, ideal for kids when the weather’s too cold – or wet – to play outside. Imagine a five-story museum just for kids, where touching the displays is encouraged and all exhibitions are hands-on. The Children’s Museum of Manhattan on the Upper West Side is a haven for little ones, fostering all learning styles with encouraged playtime. Kids can drive a pretend firetruck and crawl through a giant digestive tract all in the same day. With soft areas for those in the crawling stage or ramps for older kids to climb, the museum is geared toward children ages 10 and under. Best of all, it’s just a few blocks from Hotel Beacon. If your kids are in need of stimulation and an outlet to burn off energy, plan a trip to the Children’s Museum of Manhattan – they'll be all tuckered out by the end of the day. This beloved museum on the Upper West Side continues to captivate all ages with its broad collection of specimens. Kids love the dinosaur and butterfly displays, and they’re bound to remember the iconic blue whale that hangs from the Milstein Family Hall of Ocean Life. The displays are definitely not interactive – but the museum’s Discovery Room is! Located on the first floor of the museum, the Discovery Room is a hands-on, behind-the-scenes look at the science of the displays, geared toward kids ages 5-12. Passes are available in 40-minute blocks, and kids can hunt for fossils, track earthquakes in real-time and sift through specimen collections. 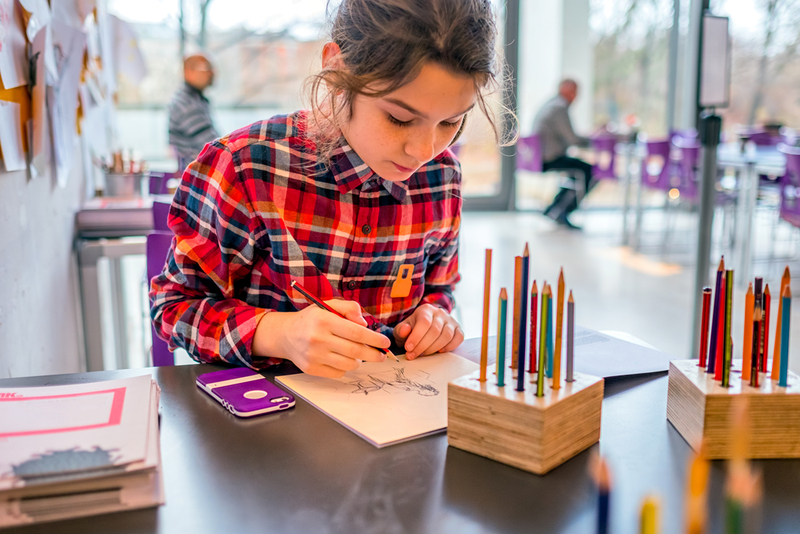 Bring color to a cold winter’s day by getting creative at the Children’s Museum of the Arts in Hudson Square. For ages 15 and under, the museum features ongoing crafts rooms where kids can get messy with paint or work with clay and other tactile materials. Programming offers drop-in songwriting classes, sound design, book-binding and video editing, best for older kiddos. Check out classes ahead of time – some require sign-up ahead of time. The Hotel Beacon on the Upper West Side is ideal for families. Apartment-style rooms with fully-equipped kitchenettes and spacious closets offer you and your little ones space to unwind. Plus, it’s located on the Upper West Side, a laid-back, picturesque neighborhood in Manhattan. Read more about our rooms and accommodations.